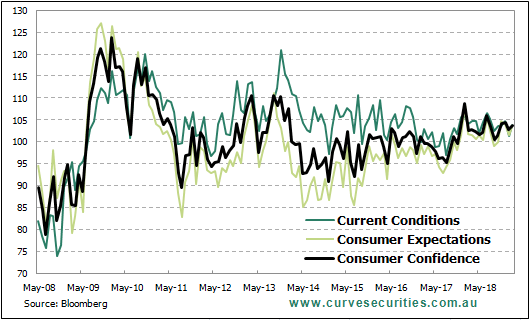 After a shaky start to consumer sentiment at the beginning of the year, consumer sentiment has now returned to pre-January levels despite significant headwinds. The consumer sentiment index rose 4.3% from 99.6 in January to 103.8 in February so that optimists now outnumber pessimists. The result partly comes as a surprise as much of the recent data has been quite weak, particularly the sharply decelerating house prices. However, despite these weak figures, much of the uptick in consumer sentiment stems from the RBA now stating that the interest rate outlook is more balanced. The higher probability of a cut in comparison to previous months was what mainly drove the increase in the index as sentiment amongst mortgagees lifted 7.4%. Another important driver of the increase was the 2.9% decline in the unemployment expectations sub-index, now putting it at a 7-year low. This is key because it means that consumers don’t materially fear losing their job and are likely to continue spending but whether this spending will match RBA forecasts is uncertain. Although this survey provides a minor bright spot in the midst of the weak data we’ve lately seen, it’s important to put it in context. Not only did the house price expectations sub-index drop to record lows, but the lift we’re seeing in the overall index is largely reversing the pullback we saw in January, continuing the sideways trend over the past year. Moving offshore, the latest US CPI data was released this morning with headline inflation dropping slightly, largely due to falling oil price but core CPI held steady at 2.2%. Continuing with US news, Fed member Raphael Bostic spoke at a forum in Dublin and stated that, “I have one increase for 2019, if everything performs as we expect it,” in line with the “wait-and-see approach” the Fed stated following last month’s meeting.